A plane crashed into a mysterious jungle leaving only one survivor, an infant child. Discovered by members of a hidden tribe, the infant was taken to their secret hidden city. This tribe had secret mental powers. As the boy grew, he learned telepathy, telekinesis, and all the sorts of mental arts that the tribe possessed. Eventually, though, the boy became an adult and, in keeping with the traditions of the tribe, had to find himself. In his unique case, this meant Marv had to leave the village and learn about the outside world. In the outside world, Marv has powers that make him peerless, but he is also a freaking idiot. Marv Thinker grew up without any kind of schooling outside training his mental powers, and he also has no familiarity with societal mores. This oblivious but powerful young man wound up in a crime-ridden American city and soon found himself in trouble with the mob (though he barely realized it). It was only the intervention of Marcy DaCosta, a private investigator who happened upon the scene. Marcy, whose business was failing, saw a chance, with Marv, to have a gimmick: a mind-reading detective would be sure to make money. 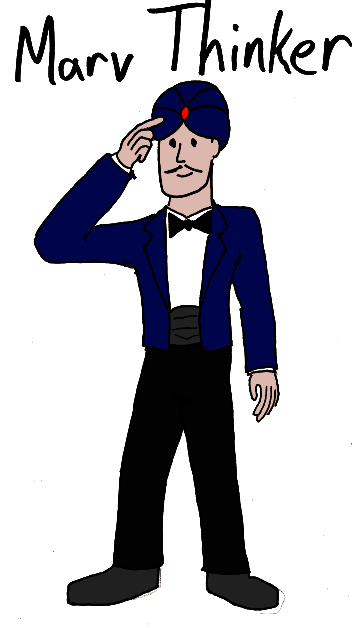 So began the Marv Thinker: Mentalist Detective Agency, where Marv is a sort of front man, and Marcy does all the actual work. Marv Thinker is one of the few ideas I’m using for a Super Sunday sketch for which I have a lot of desire to actually write. Like Noblewoman, I have actual ideas for this character and would love to get a chance to do them someday. 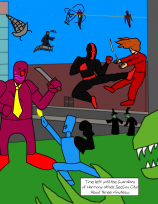 Captain Fire is the second in command of Raid Force Zero, the superhero team who live in a terrible dystopian society and fight a hard fight to improve things. With fire-casting abilities and a military background, Captain Fire is a formidable warrior devoted to saving the world. She is also capable of teleportation by fire, meaning that she can step into a flame in one part of the world and exit a flame elsewhere. She can’t take the team with her, but it is useful for occasional covert operations. 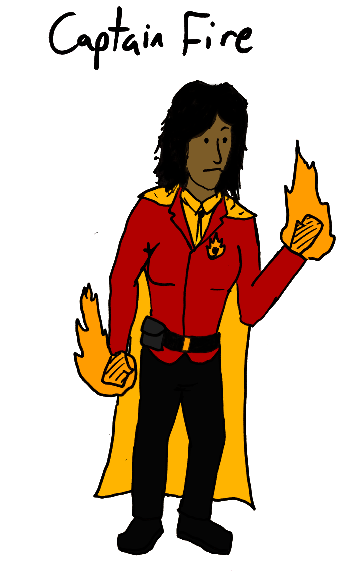 There isn’t much to say about Captain Fire, really. I like the idea of such a generic, non-gendered superhero name being used by a woman (a couple of the Captain Marvels was a woman, though that did not last), and she’s also wearing a heckuva lot more layers than superhero ladies generally get to wear. That stuff is well and good and important, but mostly I wanted to flesh out Raid Force Zero a little bit more. What do you mean “A couple of the Captain Marvels was a woman, though that did not last”? You have not been keeping up with your Captain Marvels. That’s not to say the latest one will last in the long run but you never know. What’s worse is that the awkwardness of that sentence is because I forgot about Carol Danvers altogether and was only going to mention Monica, until I went back and edited it. If I’d put more care into it, I probably could have been less of a moron. Still, effort? That’s annoying.